Kristina Swallow’s ASCE presidency began with a selfie. 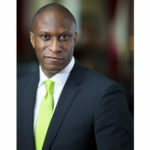 This is a president who is as plugged into social media and the modern ways ASCE members – young and old alike – communicate with each other as any Society leader in recent memory. 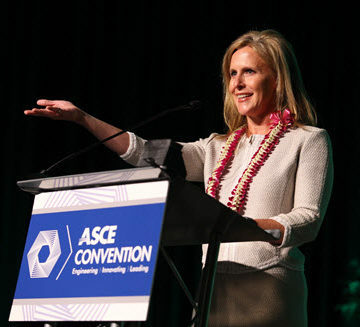 “It’s about connection,” said Swallow, P.E., ENV SP, F.ASCE, who was inducted as the 2018 ASCE president during Tuesday’s annual business meeting at the ASCE 2017 Convention in New Orleans. 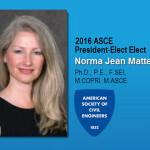 This is a president who joined ASCE committees while she was still in her twenties. A president who tweets out photos of ASCE Foundation Phil from the airplane every time she and her husband David – also a civil engineer and ASCE member – fly out to another Society event. A president who works by day as a program manager for the city of Las Vegas and trains in something called aerial acrobatics on her off time. 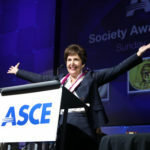 Norma Jean Mattei, Ph.D., P.E., F.SEI, F.ASCE, the 2017 ASCE president – and now Society past-president – passed the presidential gavel to Swallow in the symbolic ceremonial transfer of power. Also inducted were 2018 President-Elect Robin Kemper, P.E., LEED AP, F.SEI, F.ASCE, and new members of ASCE’s Board of Direction. Swallow, Kemper, and Mattei represent the first trio of female presidential officers in ASCE history, a fact not lost on Swallow. “This is for all the little girls out there thinking they want to be an engineer and knowing there’s a path for them,” she said in her presidential speech. 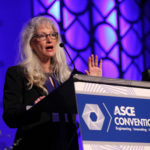 Swallow celebrated the ceremony with a large cheering section – David, her parents, extended family, and plenty of Las Vegas ASCE friends who have worked with her for years and grown in their own careers, looking up to her as a role model. And now, as the pomp and circumstance die down, it’s time to get to work as ASCE’s new president.